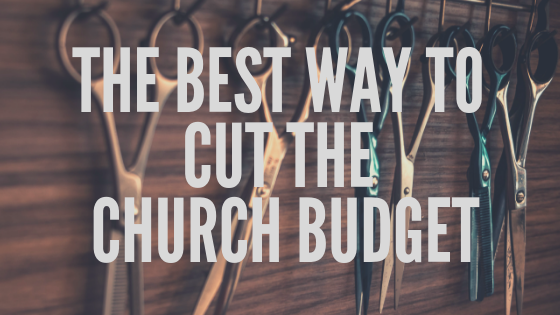 It’s never a good thing when you have to cut the church budget. Luckily, I haven’t had to do it a lot, but this year was one of those years. Despite the economy improving in my small town, giving still didn’t hit the levels I was hoping for. If you find yourself in the same position, whether this year or in the future, I want to share with you a few tips I’ve learned over the years. Cut low performing ministries first. Is there anything your church is currently doing that you wouldn’t be doing if you had the opportunity to start over fresh? That’s a good way to identify where you should start cutting. If it doesn’t line up with the vision of your church or if it’s not getting results, then it’s time to stop funding it. Small town churches are notorious for keep ministries going for years that haven’t been effective in decades. Have the tough conversations before it’s too late. Identify areas of waste. I recently talked to a pastor who was debating the need for bulletins in his church. He said every Sunday he was picking up dozens of them after service. Not only was this wasting resources, it was also wasting the time it took for someone to prepare them. Could you move to a monthly bulletin? Could you move your bulletin online? Could you work from home, instead of trying to heat or cool a building that remains mostly empty throughout the week? You get the idea. Press the pause button. Is there anything we can stop doing now and then bring back as finances allow? Maybe you’re used to catering some meals during the year, but for a season you have to ask everyone to bring a dish. You may not be able to buy fireworks for that Fourth of July event this year. You may not be able to give to certain mission organizations. At times, you may have to press pause on some things you really want to do in order to keep the church going. Cut salaries last. Unless it is obvious that their position is no longer needed, they are overpaid, or they are hurting the church in some way, try not to cut salaries. People are your most important resource as a church, and eliminating team members can have a very damaging effect on the church and the finances. How have you handled budget cuts in the past? Share what you’ve learned in the comments below, and if you ever have questions about creating or pruning a budget, shoot me an email. I’d love to help. Get rid of anything and everyone on the budget that the early ekklesia did not have or need and start over to love your neighbor and forgive your enemies. If the tradition or ritual has no foundation in the new covenant trash it. Follow Jesus not religion. Money power control? You need those to run a church. Jesus is enough for the Ekklesia. Acts of the Apostles 2: Ekklesia in action. How does your congregation measure up? What man-made “skubalon” have you added or accepted from man’s tradition in your gathering? I pray for unity and return to the Holy Spirit control of the Lord’s worship across the land. We are so divided and denominated over silly stuff that will not matter as much as our attitude towards unity. Satan laughs and God cries. Thanks for the comment Sonny.